There are literally thousands of equities and funds (of the mutual, closed-end and exchange traded varietals). A prudent idea may be to consider the investment decisions made by one or a few of the more respected investors within the market. Warren Buffett is considered one of the best long-term investors out there, and Berkshire Hathaway (BRK.A) holds several large positions in well-known American companies. Additionally, most of his publicly traded investments have above-average dividends and a history of growing them over time. Below are Warren Buffett's largest equity investments according Berkshire Hathaway's last 13F quarterly filing. I have only listed those positions valued at over $1 billion, listed in size order: Coca-Cola (KO), International Business Machines (IBM), Wells Fargo (WFC), American Express (AXP), Procter & Gamble (PG), Kraft Foods (KFT), Johnson & Johnson (JNJ), Wal-Mart Stores (WMT), ConocoPhillips (COP) and US Bancorp (USB). I have provided each equity's present yield as well as their 1-month, 3-month, 6-month and 2011-to-date performance rates. Most of these stocks have acted somewhat resiliently this year and through the recent sell-off. 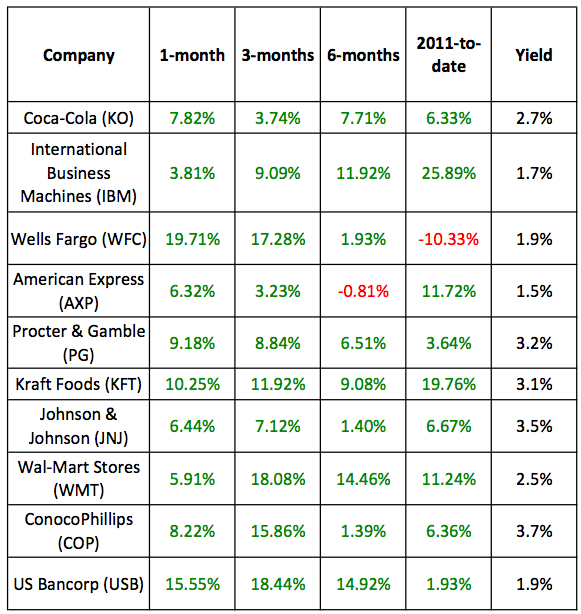 The best performing listed equity though 2011 is IBM, followed by Kraft. Buffett's acquired the majority of his IBM position in the second half of 2011, and he trimmed his Kraft position through the year, following the Cadbury acquisition. IBM is now Berkshire's second largest holding, behind Coca-Cola. Within the last month, Buffett's banks (Wells Fargo and US Bancorp) have been his top performers. Nonetheless, of the listed equities, these are his worst 2011-to-date performers, with Wells Fargo being the only listed equity to be down since the start of the year. Many individuals may also appreciate that these companies are generally familiar. Additionally, these companies tend to grow their dividends, which is something most income-oriented investors usually appreciate. Most investors, even if they are new to investing, are likely familiar with several of these companies, if not all of them. This familiarity also makes it easier to understand the businesses, and also makes information on the companies more readily available and discussed.